We control every phase of the grape-to-bottle process. 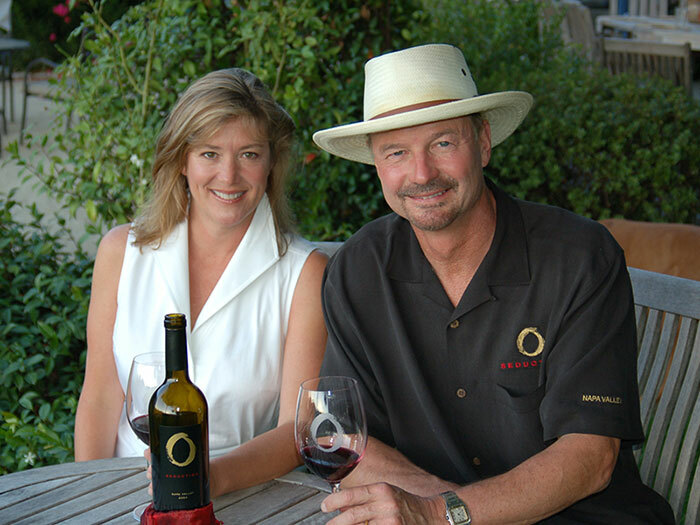 The O’Briens visited Napa Valley on their third date, and each of their dreams eventually came true. It started as a romantic dream when we visited Napa Valley on our third date in 1987. Barbie said, “I dream of owning land in Napa Valley,” and Barton put it on his to-do list as he dreamed of marrying Barbie. David Cofran of Silver Oak. He was a neighbor of ours who helped Ray Duncan and Justin Meyer found Silver Oak and had been the general manager for 20 years. He helped us make our first four vintages. Working in the beauty of Napa Valley, meeting wonderful people, crafting the beauty of nature into great wine. As everyone knows, it is not easy to make money in the wine industry. Our wines are estate-bottled from grapes we grow in our 33-acre vineyard adjoining the winery. We control every phase of the grape-to-bottle process. We just purchased a $300,000 bottling line for our 5,000-case production as an example of how obsessive we are about quality. We are sustainable farmers and minimize our irrigation water use. As water becomes more scarce, minimizing the use will be a critical issue. We do not use pesticides or herbicides in our vineyard. Starting software and biotechnology companies. Jesus Christ, Mohammed and Buddha. Think hard about your true motivations for doing so. Success requires focus, commitment and hard work. It’s not for the faint of heart or those seeking easy profits. We once started a temporary Halloween theme park called the Scaregrounds in Pleasanton in 1993, had 75,000 people come, and were featured on Entertainment Tonight. But we lost all our investor’s money, then retreated back to the software industry and co-founded Calico Commerce in 1994, which went public in 1999.